Last night, Justin came through The Tonight Show Starring Jimmy Fallon, to get mugged, talk babies, drink tequila, partake in the gift that keeps giving -History of Rap....6 - and last but not least, judge a mighty competitive lip syncing contest between Ellen and Jimmy. Because why not. Congrats to the new season Jimmy and The Tonight Show. Our cheeks still hurt from laughing so much. Seriously though. Genius line up adding Ellen to the JT/JF crazy! Do The Roots get credit for The History of Rap 6 Medley selection? The Inception Mug is a must have! Silas said Daddy, but he definitely looks like Mommy! 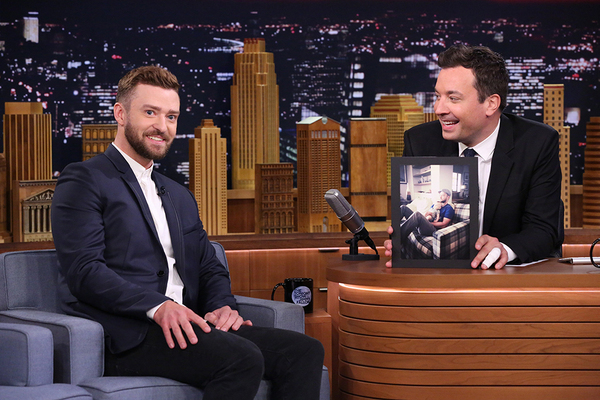 What's next for Justin Timberlake? #JTFam! I swear they get together just for us. I laughed so hard, screamed so loud and danced with them. im so proud of them you complete me guys....!!!!!!!!!!! !